Thoughts on the Journey: "Off the Couch"
It seems we're always changing, or else we're dead. Physically, our bodies are constantly changing. Some are getting older and breaking down, some are growing new life inside them (that's weird and amazing at the same time), some are getting rounder and some are getting muscular. Our bodies are always changing. In fact, just in case you don't think yours is changing, know that your ears and nose never stop growing throughout your whole life. So why do we fear change so much as the church. Jesus compared us (the church) to a body so change is inevitable. If we don't change and see new life come to the church it does the same thing our natural body does; breaks down, gets out of shape and eventually will die. Walk into any church more than twenty years old and see if they've embraced or pursued change. It's not hard to figure out. We don't really have any way to stop this process. Physically, our bodies just get worn out over time. If we spend our life exercising, filling ourselves with good nutrition and never taking any risks, we can extend our life, even slow down the aging process, but eventually are bodies wear out. Some people try to fake their bodies wearing out with plastic surgery and Botox but it's pretty obvious that you can't fake the natural process that's taking over. The church is the same. If we are spiritually active, eating the bread of life and filling up on the fruit of the spirit, we'll retain our vitality as the body of Christ. In fact spiritually, we actually get to see and enjoy the new life that is created from this. We get to see a shadow of the new body that we'll get when the final restoration comes. When we start trying to fill the church with false things, false spirituality, it's painfully obvious that we're just masking the slow march to closing shop. I know it's scary to take risks, what if we fall and break a hip - that'll be painful - some people never recover from it. What if we're so out of shape, we don't know where to start? 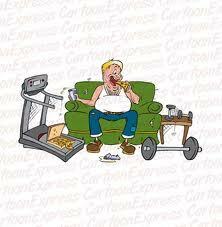 Once or twice a year I usually decide I'm going to start working out after being on the couch for 6 months. In fact, I'm thinking about it right now, maybe I'll start tomorrow. On day 3 after I work out though, I'm so sore I don't want to get out of bed. But if I stick to it, by day 10 I can feel a change in my strength. Now, I usually quit by day 30 because I am not very disciplined, but I often think of what it would be like if I made it through a year. What if we never take any risks spiritually? What if we never step out to go for what the spirit is calling us to? We probably won't hurt anything, but we'll slowly grow stiff and cold and although we may not break a hip, our joints become too sore to use anyway. We get so inflexible that we can't even get up to go after the spirit. Our muscles are sore after we start a workout because we actually create tiny tears in the muscle fiber but the muscles repair and add new muscle fibers to make you stronger. Spiritually sometimes we need things to be stretched and torn a bit too so we can make room for the spirit to work in those places. He is made strong in our weakness. The problem is we often give up on day 3 when we start on a spiritual workout. We have a hard time getting through the pain that it brings. Let's face it, lots of us have a whole bag full of junk we have to work through spiritually and the church as a whole has warehouse full of baggage, sometimes it's easier just to stay on the couch. You will see a huge change in your life if you work through it. If you have been on the couch spiritually for any length of time, you don't need to jump up and do a marathon of evangelism and healing - it'll probably give you a spiritual heart attack - but you've got to start somewhere. Try going to a weekend retreat, try listening to a Podcast of some speaker you've never heard or try reading different translation of the bible. It'll be like drinking a protein smoothie. As the church, we have to start somewhere if we want to see people's lives changed by Jesus. It's obvious that whatever we're doing is not very spiritually active. Churches in general are not growing; new people are not coming to hear the good news. We have to be willing to get up and do what the Spirit is calling us to, even if it seems risky, even if it's a little bit painful, if we want to see new growth. Jesus will be made strong in our weakness if we're willing to take the action he lays before us. There are probably as many work-out programs as there are church programs and everyone thinks theirs is the best one. Circuit training, muscle group focus, high reps-low weight, low reps-high weight, machines vs. free weights, protein powder, steroids... pick one, they'll all do something, I don't know which is most effective, who cares (don't pick steroids, they are the obvious fake thing I was talking about earlier, people can tell when you're on the juice), maybe you just need to start by going outside for a walk in the fresh air. Churches are the same. Preaching, small groups, outreach, Sunday school, prayer meetings, committees, bake sales, worship nights... pick one, they all do something, maybe you just need to go for a walk through the neighborhood and pray to see where the spirit wants you to start. I think we just have to be willing to push the boundaries of what we know a little bit (maybe a lot). If I work out for the next year and only do arm curls with 20 pound weights, my arms will not get stronger and the rest of my body will not be affected at all, I will not grow. If I go to a prayer meeting for the next year and never try to go further after what the spirit is saying, I will not grow. We know the results if we don't go after things spiritually, both as a church and individually, we get old and stiff and die. I wonder what it would look like if for a year, we stuck to going after the spirit rather than just sitting back in our traditions and programs, hoping the spirit just does something. How much would we grow? How much stronger and spiritually in shape would we be? If you want to find out, start coming to church ready to respond when the spirit moves, start going to prayer meetings expecting the spirit to answer your prayers on the spot or start teaching Sunday School as if what you're teaching the kids, the spirit is using to change their hearts. Start walking around willing to look foolish before man, if it means Jesus gets glorified. Have you ever seen those huge guys working out at the gym? They wear spandex, make all kinds of grunting noises and push each other to the next level. They look and sound ridiculous to me but it obviously works. They are huge. Have you ever seen people who are actually impacting the world for Jesus, they speak his name at any cost, the gospel is more important than the clothes they wear, sometimes they even make funny noises and say strange things, but God is using them. Is he working in your life, or do you need to get off the couch? My friend Scott and I have this agreement that we're going to run a marathon "off the couch". No training, no problem. It drives his wife crazy when we talk about it, because she's actually a runner. I'm not sure about him, but I'm sure I will be in the hospital if I attempt it. Spiritually, though, I know I need to get off the couch (as I sit here on my couch writing this) or the purpose God created me for is going to fade away. I'll get old and look back to remember the chance I had to follow the life of the spirit. I'll be bitter and jaded because I see people all around me living life in the spirit but my heart will be too cold to go out with them. I don't want this, I hope you don't either. What do you say we start pushing a little bit, one more curl, and see if we can build a little spiritual muscle. I love what you wrote, I'm on the couch beside you, I was there before you. I need to get up and move. Thank you Joe, I hear what you're saying.